Get Your Limited Edition State Quarter Keychain Today. An authentic State Quarter of Your choice is protected in a clear case and attached to a keychain & ring. The State Quarters have been minted once and never again. Collectors have pulled many of the quarters out of circulation already. Reports indicate that the 1999 state quarters are already worth 300-400% of their face value! Get yours today while supplies last. DE, PA, NJ, GA, CT, MA, MD, & SC Keychains are in stock. The 50 State Quarters Program is ‘changing’ the ‘state’ of coin collecting. Approximately every 10 weeks from 1999 to 2008 there will be a new state quarter to collect. Each quarter’s reverse will celebrate one of the 50 states with a design honoring the state’s unique history, traditions, and symbols. The quarters are released in the same order that the states joined the union. A Great way to celebrate your home state and save a part of history…Change is exciting! SPECIAL LIMITED TIME OFFER...Receive a $5.00 bonus when you register with PayPal for FREE (No cost or obligation). Click on the FREE Icon below for details. Golden Dollar Keychain! Click on the $1 Coin below for details. 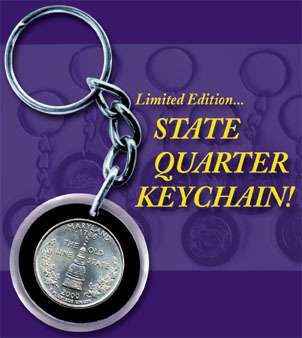 Order Your State Quarter Keychain Today! Future quarters will be made available as soon as they are released from the Mint. To learn more about the State Quarters visit the US Mint by clicking on the link below. If you have any questions, email us by clicking on the Email link below.